News Flash: Live Wires are Hot! As JKI grows, we’re devoted to sharing more hot LabVIEW stuff with as many folks as we can. 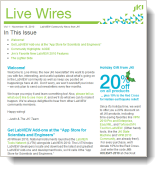 So last month, we rolled out a brand-new newsletter, Live Wires!